The Starzz had a tough start as they were only leading by 2 at the end of the 1st quarter, which lead to Starzz's MVP, Chenai D to score 18 points consecutively in the 2nd quarter and 3rd quarter, scoring 14 points in the 2nd one alone. The Starzz only hit one from the 3pt line and it was their last basket in the game (Fayette M was the shooter). Flames' highest scorer was Dorothy O with 18 points (3x3pt), followed by Tonight S with 15 (2x3pt) and Princy M with 10 (3x3pt). On the Starzz side, Chenai D hit 35 points, followed by Tessa A with 12. Once again the T'hawks were leading the whole game against the Dodgers only to loose control in the last 24 seconds, almost losing it again. Dodgers' highest scorer was "2004 Season MVP" G Walaka with 25 points, followed by Clara M with 15 and Claudette G with 8. On the KBA Cup Women Finalists side, the best scorer was Rookie Monde S with 19 points, followed by Gloria H with 17 (1x3pt) and Conceicao N with 10. 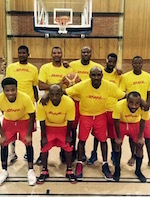 Both Tomahawks and Civics teams (Male and Female) qualified for the KBA Cup Final Round, which will take place on Friday, 14 October from 19:00.